« Eurotour of 2014 Part 2. Next stop, Poland. The country has gained a reputation as being a difficult place for groundhoppers to go. Serious crowd problems have led to membership card systems, and although one can generally get in, using the passport for ID, there are exceptions to the rule and some high security matches where it is just not possible to gain entry at all. Having not been for nine seasons, I dipped my toe back into the water last season, by trying for a press pass for a couple of matches. One of these, which may have been the worst match for hooliganism in the country was Lech Poznan v Legia Warsaw, while the other was Piast Gliwice v Korona Kielce. 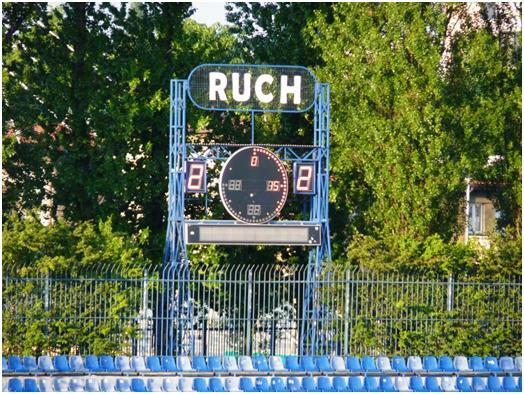 Lech turned me down, and there was no way I was going to try to get anywhere close to the stadium without a ticket, but Gliwice was happy to let me in for a match in which they failed to live up to their league position, only managing a draw which contributed to them dropping out of the Europa League placings. 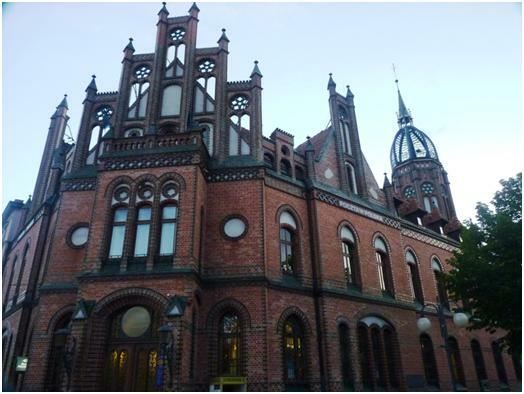 Not far from Gliwice is Chorzow; both are former mining and industrial towns in the area of Silesia close to Katowice. I stayed in Katowice last year and was disappointed by the place, feeling I might have been better off heading into Gliwice which has a bit of history to it. 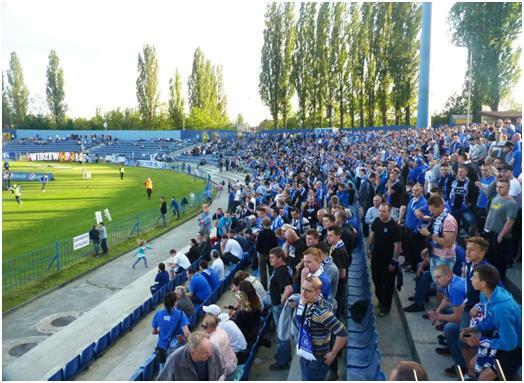 Ruch Chorzow responded positively to my request for a ticket, so I decided to stay in the town itself. The approach by rail is grim, the line passes no end of dead industrial sites, where even the demolition seems to have drawn to halt, leaving concrete skeletons sticking out of the ground as a reminder of the times when the area had full employment. 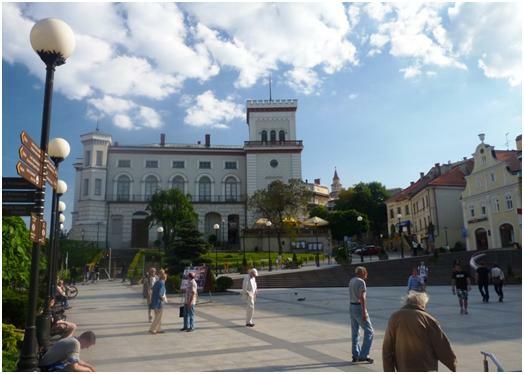 However, the town centre is very different – a bright and cheerful pedestrian street (with a bus/tram route running in one direction down the centre), there are plenty of cafes and people enjoying the arrival of warm sunny weather after the dreary rains of the week before. It is not an exciting place, the only building that really catches the eye is the post office at one end of the street, and when I went back after the game, there were few options for beer and food. The Blues Hotel is on the main street, and is a well modernised hotel, even if the entrance (off a courtyard from the main road) is somewhat dreary. I arrived by train, a suburban line out of Katowice which as I discovered was run by a private company and not included on my interrail ticket. 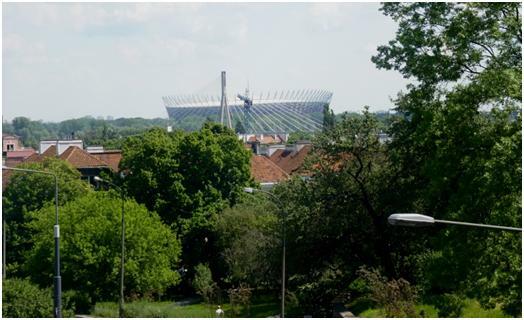 I left by tram, more frequent, but slower to make the journey and running along a more modernised road, past the Slaski Stadion which has been well used in the past for international games. The gleaming office buildings on the Katowice to Chorzow road paint a start contrast with the dead industrial landscape of the rail route. It appears that rather than regenerate the areas used in the past, they are being ignored, and neighbouring areas are now used for development instead. From the hotel, it is a 20 minute walk down to the stadium. Plenty of life around the stadium, and there is a ticket kiosk, so I could probably have managed to buy a ticket. When I ask to find the press accreditation point, I am just waved through and end up in the press room inside the stadium, without first collecting a pass. However, inside the stadium I am introduced to Donata, who I had communicated with by e-mail, and she actually gets a card sent up to me in the stand. Not really required, as I would only now need it to go to post match press conference. There is a newspaper style programme, which was available both at the ground, and also at the club shop in the town centre. 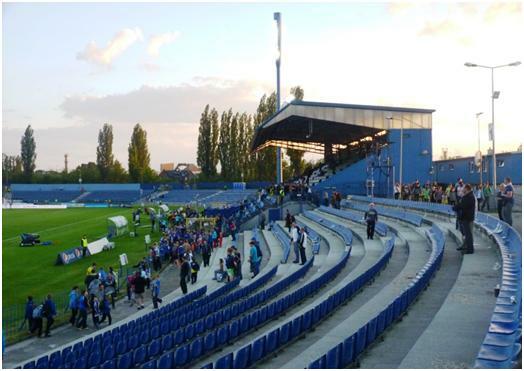 The stadium is clearly recently modernised with the exception of the stand, which provides the only cover. All around the rest is clean fresh concrete steps, most of which (but not all) has seats bolted down. The steps curve around both ends of the stadium, and there is still room if they want to use the ground as a (grassed) track. One end was practically empty, and I asked about the lack of away fans. 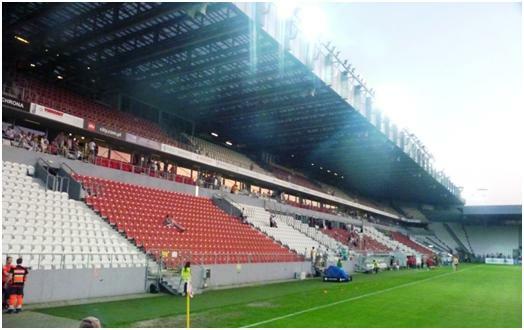 A journalist told me this end was closed due to incomplete building works, while Donata said Wisla Krakow fans were refusing to travel due to a disagreement with the club’s owner. With Legia having taken the title, and Lech the runners-up spot, there is one Europa League place still to be awareded. Ruch Chorzow start in prime position, three points ahead of Wisla, although only two up on Gdansk, who had already played their game in this round, and beaten Lech. The Polish Ekstrkalasa, or top division now has 16 teams, and after they have completed home and away fixtures the league splits into two sections for single round robin groups, meaning each team plays a 37 match season. The game started well, plenty of football was being played, creating chances at both ends. 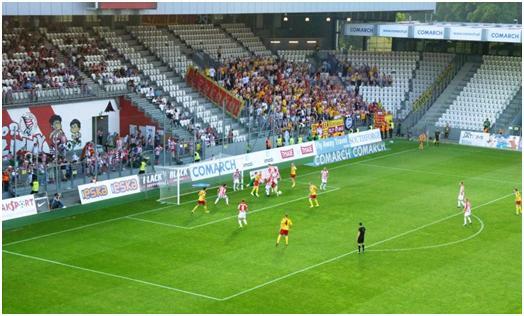 I though Krakow appeared to be the better side, and I was not surprised when took the lead midway through the half. If anything, this stung the home side into action, and they levelled through a penalty five minutes later and then took the lead and were now clearly on top. A second penalty, awarded just before half time allowed the teams to go in level at 2-2. Sadly, the second period did not live up to the excitement of the first. Ruch’s best player (and second goal scorer), striker Grzegorz Kuswik went off injured at the break, while Wilde Guerrier, a winger who was making things happen for Wisla dropped back to a more defensive position. As the half drew on, Wisla seemed happy to settle for a draw, conceding a couple of yellow cards for time wasting. As in the game the year before at Gliwice, I failed to understand this approach – a win was within either team’s grasp, and the winner would have been favourites for the Europa league slot. With Ruch facing both Legia and Lech (and both away) in the next games, I feel they have certainly missed the boat here. 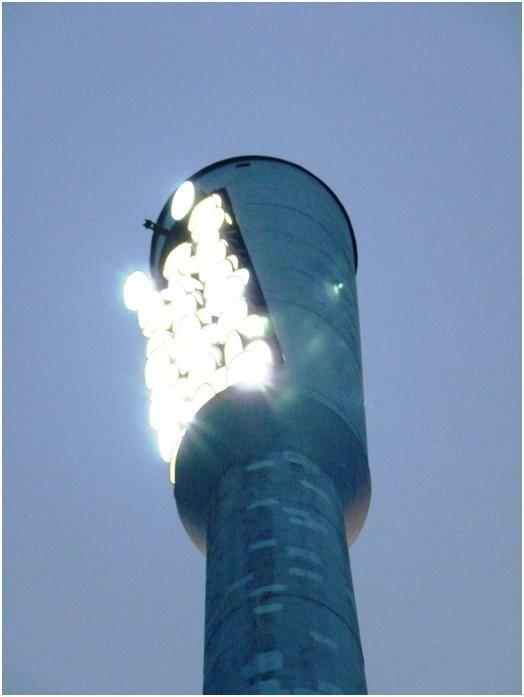 You can’t beat a good Eastern European Floodlight Pylon. There is a nice little café next to Bratislava station, where they sell the decent Slovak dark beer, and have enough English to understand when I ask for it. I was not intending to stop here, but the train from Katowice into Bratislava stopped just outside the station for 15 minutes, meaning I just missed a connection. With just 30 minutes to wait to the next train, what else is one to do but sample the local beer? The trains to Dunajska Streda are not listed on the Interrail App I have on my telephone. I also cannot find them on the German rail site, normally one of the best train sites on the net, but from the Slovak rail site, I do manage to download the times in a pdf file. The reason I could not find the trains on the App is simple, the interrail ticket is not valid on this route, as it is run by an independent company. It is then hit or miss whether your ticket is accepted on the train, depending on whether the train staff know the rule, and whether they can tell you there is a problem across the language gap. The result is that Peter, on different trains to me, and actually staying in Dunajska Streda gets away with it, while I pay €2.55 on the outward leg, and €1.50 for the return. The trains run by Regiojet and nice modern stock with internet connections, although it did not work on the train I went out on. I am met by Peter at the station, and we wander into town. It is a reasonable town, but with nothing particular to commend it. 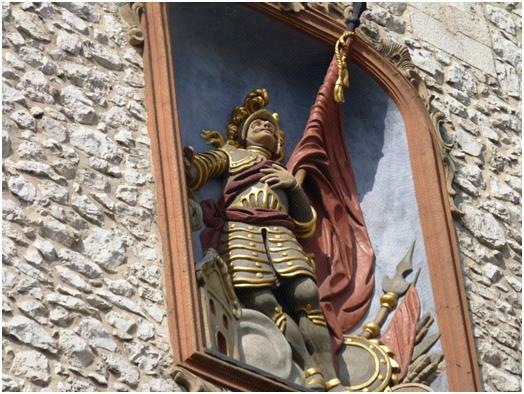 We go into a bar just off the town square, where we find the dark beer is not the Slovak beer, but imported wheat beer from Munich, at twice the price. We drink it anyway before completing the short walk to the stadium. The area around the stadium is surprisingly busy, my experience of Slovian football has always involved small crowds, except for an important game at Slovan some 15 years ago. The league table shows the home team to be six points above the last place (only one relegation) with two games to play, that border line between safe and mathematically safe. 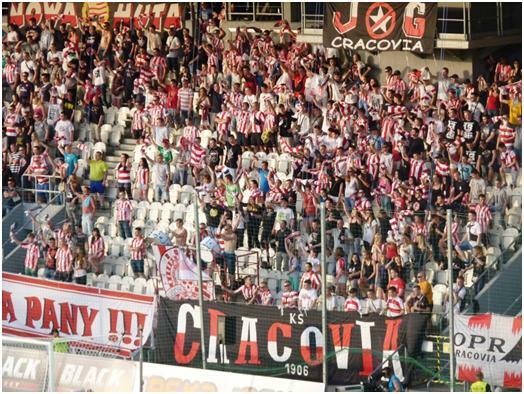 Spartak Trnava have their Europa League spot booked regardless of the result. The answer is in a footnote at the bottom of the table. 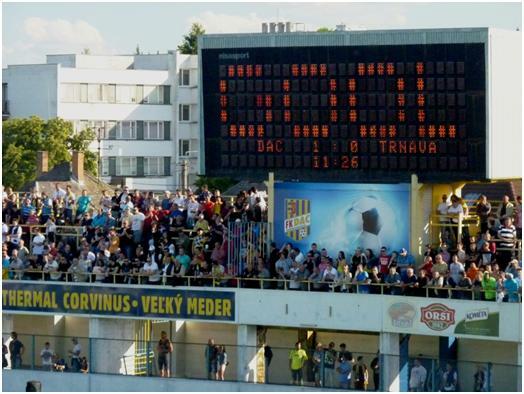 DAC (the general abbreviation of Dunajskastreda Athletic Club) were to have six points deducted from the final table, but they were not shown yet, so the lead over Nitra was actually goal difference only. Why the Slovakians should deduct points and not show them immediately is a local issue. Why the points were deducted is not. One of the early games in the season for DAC was fixed. As it happens, DAC lost the game by 4-0; now betting syndicates fixing matches do not make their money on the heavy favourites for the game winning the match, and no one in their right mind bets on the actual score. The bets are placed early in the second half (when the score was 2-0) for at least two more goals to be scored by the winning team. Naturally this happened. Looking at the video of the game, one can see the defending is atrocious, but cannot safely say the score is fixed. Still four DAC players, (one of which was not in the pitch, having been substituted at half time were charged). Only one of the quartet admitted the charge, but three DAC players and one from another amateur club suffered lengthy bans (for a professional footballer, a 14 year ban is the same as Sine Die). As the points deduction was applied as well, I guess there was some complicity from the club in the affair, although it was not enough to actually throw them out of the league. Peter had said he had arranged two press passes. 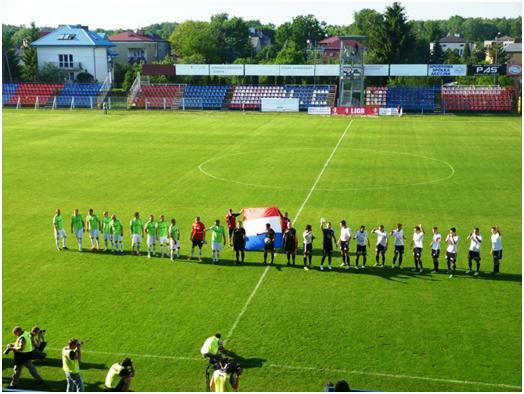 I tend not to bother in Slovakia, it was easily possible to pay €5 for entry, despite the big crowd, and one can normally wander around to the press area to pick up the team list. As it happened, we were not added to the list, but were let in as press anyway. The stand areas were full and we ended standing at the back of the press area. We even managed to get something to eat and some very strong alcohol (a local schnapps), as guests of a very drunk Hungarian in the VIP zone, whose English was good enough to invite us in, and tell us he supported Ferencvaros, (although his shirt said Celtic). It was not good enough to tell us why he was at the game (with VIP ticket), or to sort out a ticket for Sunday’s Hungarian Cup Final. 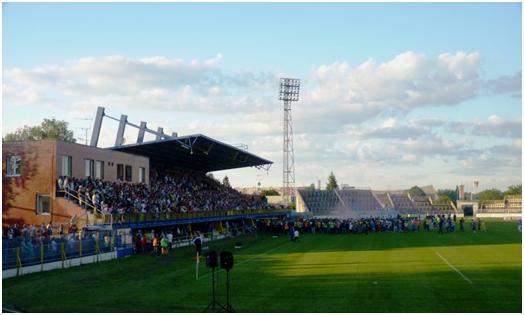 The ground consists of a quite old main stand, with a larger, newer stand opposite. The main stand has been extended with uncovered seating in front of an an office building, and provides a sheltered area acting as technical areas and I think some wheelchair accommodation. The opposite stand has a paddock in front, I think this had bench seats, although no one sat on them. 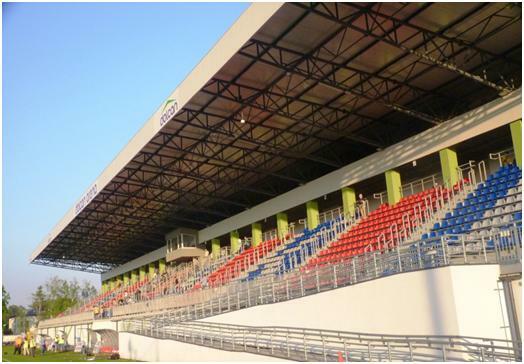 Both ends are curved behind the grass track, and consist of segmented open concrete stands. The ground is technically all seated, but I would say that over half the crowd did not sit down at any time during the game. Some of the seating is bench, rather than individual seats, especially on the curves. Both covered stands appeared close to full, and the open seating at the town end was close to full, (this is where we would have probably ended up if paying our €5). The main singing section for home fans was in the newer stand, The far end held around 200 Spartak fans, with a line of police in full riot gear (very hot with no shade, and temperatures around 25C) between them and the pitch. Peter has seen a game abandoned due to the antics of these fans, so it may be the police presence is required, but it does not appear they are going to cause trouble today. The game was not bad, DAC needed to points and Spartak were not there to be rolled over. There was only one goal, scored after just 11 minutes when a direct free kick from Szabo curled inside the near post. The game stayed entertaining throughout, despite a little time wasting from DAC near the end, (two yellow cards for time wasting, but the time concerned was not added on at the end – so probably a good deal for the players getting booked). 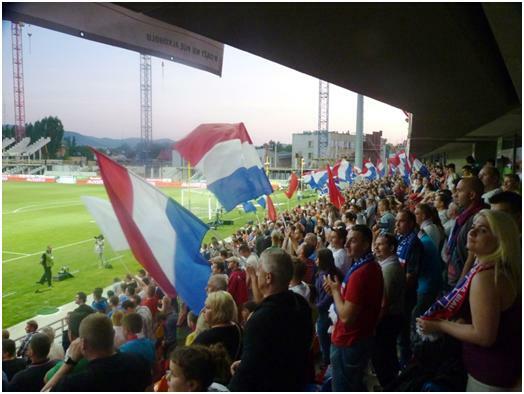 I think this was the best atmosphere for any game I have been to in Slovakia, with both sets of fans singing throughout. At the end of the game, home fans were allowed to celebrate on the pitch, but they were polite enough to wait for the Sparta players to leave first. Nitra lost in Bratislava and hence DAC were celebrating safety, but with only three points margin and a game to go, and a not insurmountable goal difference advantage, there is a risk that the celebration is premature. 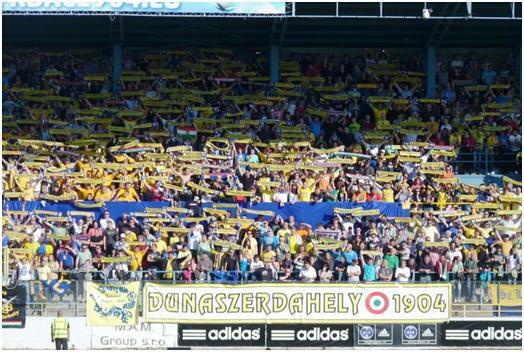 The crowd of 7009 was the biggest in the country this season, and about three times the average crowd at DAC, (or in the league generally). I have a couple of beers with Peter, leaving him to complete his meal when I head back to Bratislava. From there it is the night train to Warsaw. I have a sleeper booked, with a lower berth, but it is old Polish rolling stock. The only electric socket is a shaving point, and this does not actually have electricity. I explain to the steward that without power for my anti-snoring machine, I am going to disturb the other passenger, and he moves me to a compartment on my own! Still, I sleep better with the machine, so I arrive tired in Warsaw. Fortunately, my excellent choice of hotel allows me to check in straight away. It’s the Hotel Maria, and receives my recommendation as a hotel labelled as two stars, but would be a good three star hotel if they added a lift! Entering the city at one station and leaving from another, the hotel has the advantage of direct tram links to both. Rested a little, spending some internet time and using the hotel printer to sort out a ticket for the Hungarian Cup Final, I venture out into the midday sun, (well, I am an Englishman). The city seems larger than most I visit, and has a lot of contrasts, big modern steel and glass blocks near the centre, where we can see it is not completely Americanised – there is only a Starbucks in every second block, contrasting with the meticulously rebuilt “old town”, (it was near to completely destroyed in response to an anti-Nazi uprising in 1944). Even before the war, the old town is not as old as the new towns I had visited in Austria and Slovenia the previous week! There is plenty of open space, but also a massive amount of apartment blocks, and thousands of small shops and roadside stalls, selling just about everything, (although when I asked for shoelaces in a shoe shop, the answer was nyet). The station for the suburban train to Zabki was typical of the contrasts. One approaches from a dreary street, but to the other side is an ultra modern shopping mall. The train is a rickety computer special, and seats are at a premium. Fortunately, the journey time is only seven minutes. Knowing that I want to leave the station heading away from Warsaw, and seeing what appears to be steps under the line at that end of the platform, I follow other passengers that way. As it turns out, the steps are under construction and the passengers clamber down the three foot drop to the rail level and then just walk across the track. I follow suit gingerly, but resolve to find a better way back to the station. The other end of the station has a path from where a road crosses at level crossing gates. The path runs between the tracks. 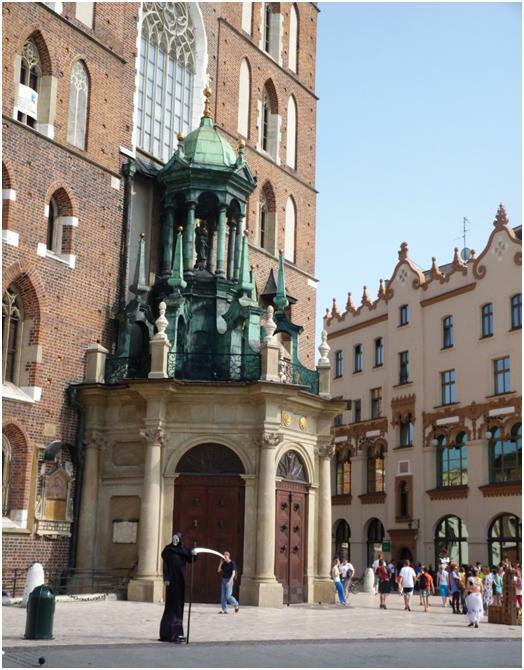 The ground is easy to find, and again it follows the Polish rule of contrasts. 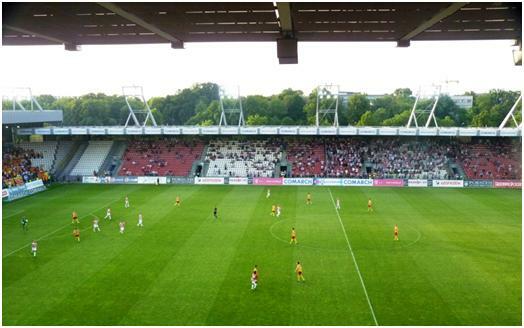 One side is a really modern concrete stand, while the other is a few rows of rather decrepit open seating. Behind both goals is just wire fencing, with enough advertising banners to prevent any free viewing through the cracks. There are hardly any people outside, half an hour before the start, but most are queuing, either to buy tickets, or to get through the security check to the gates. I am more fortunate, two nice ladies by the central entrance to the stand have a list of VIPs and a small pile of press cards. One of the press cards has my name on it, and I am ushered inside. While those going through security may have drinks bottles confiscated, my option to get water is by taking a similar bottle from a vending machine. It takes me a few minutes to get water, get a team sheet and then notice some people have programmes and so I go in search of these. They are hidden behind the desk at reception. The programme is a rudimentary affair, four pages of A5 containing the team squads, league table and a team photo. It appears to be only on offer in a VIP area, and to those in the press area that ask for it. 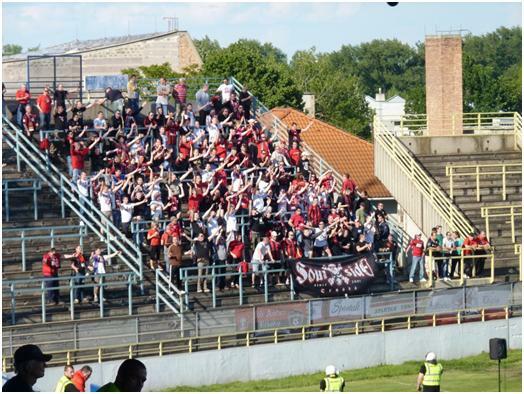 I did think that the far side was not actually going to used, but just on kick off, around 20 or 30 Belchatow fans were admitted to this area, most of them missing the actual start of the game. Belchatow started the day in joint top position with Gornik Leczna, while Dolcan Zabki were six points behind in fourth place having dropped points at home to relegation threatened Rybnik at the weekend. When the game started, it was easy to see Zabki dropping points again, with Belchatow enjoying all the early possession and creating several chances. However, careless tackles in the box seems to be a feature of the Polish game at the moment. After two first half penalties at Ruch on Monday, we had two more here. Both went to Zabki and both were scored. Belchatow came back strongly after the break, making twin substitutions, at half time. I cannot recall any other team not just playing with twins, but bringing both on as substitute at the same time. Why they did not start is not clear, as one of the pair is the club’s leading scorer this season. 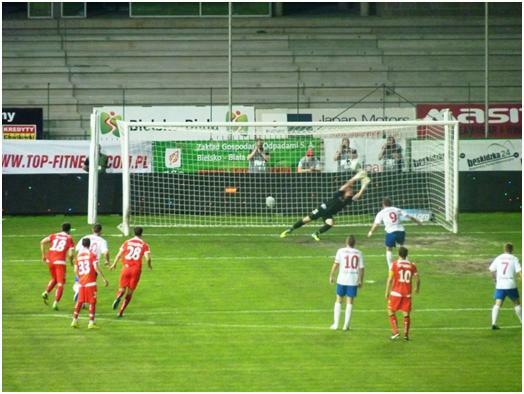 Anyway, their game was livened up, but Zabki held out until the 70th minute before conceding a goal. 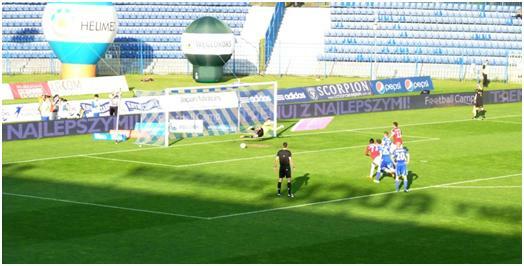 Belchatow were not a team for giving up easily and they camped in their opponents half after scoring, but this was to no avail, and the score finished at 2-1. With a total crowd of 650, and only around 20-30 away fans, it was quite amazing to see how much of a security operation was employed to make sure the two groups never met. 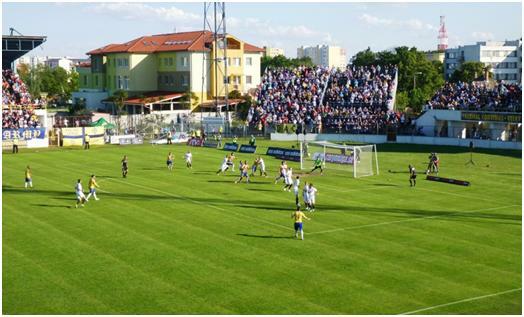 Clearly, if Zabki defy the odds and win promotion, few is any top division games will take place in this ground. 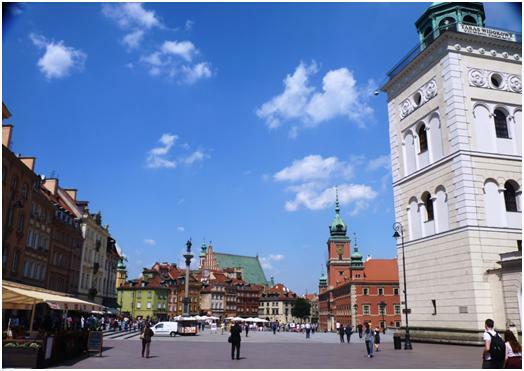 The word is that Polonia in Warsaw could stage their games. Polonia were top division until last season, but their continual financial crisis’s finally caused the club to fold, with a new body starting at level six of the Polish leagues. Even then there were reports that the first game for the new club had to be abandoned when it was interrupted by Legia fans. The name Dolcan, by the way, is a sponsor’s name belonging to a house building company. 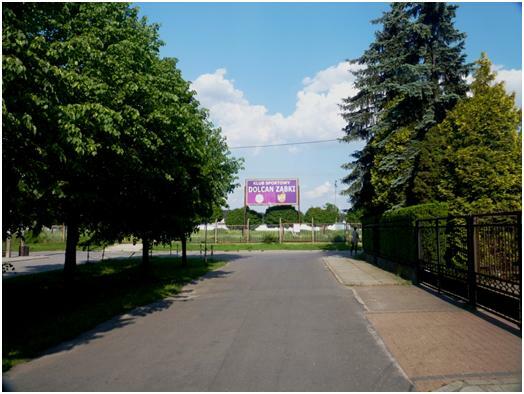 They have restyled the ground with the name Dolcan Arena, but while this is written in large letter on the side of the ground, the club do not even include it on the programme, where the venue is listed as Stadion Miejski w Zabrach, (which you can translate as Zabki Town stadium). 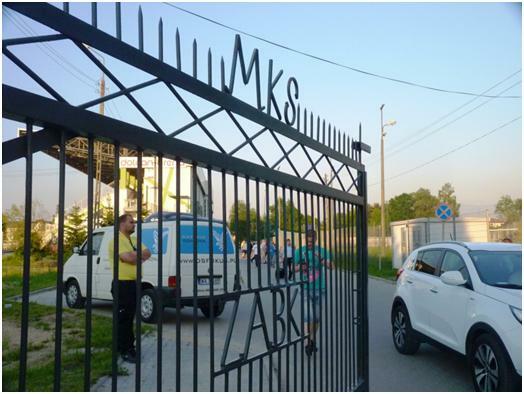 Ironwork on one of the gates refers to MKS Zabki, (MKS basically means Town Sporting Club, and is a relatively common prefix). It appears though that Dolcan is part of the club’s official name, as SSA Dolcan Zabki. The second gate had the word Dolcan added in ironwork that does not quite match the rest of the gate. Back down to Silesia, or more precisely, Podbeskidzie. I had to ask what exactly what this club prefix means. It appears it is a name for this ill defined region of Silesia, that would prefer not to be judged with the decayed industrial zones further north. 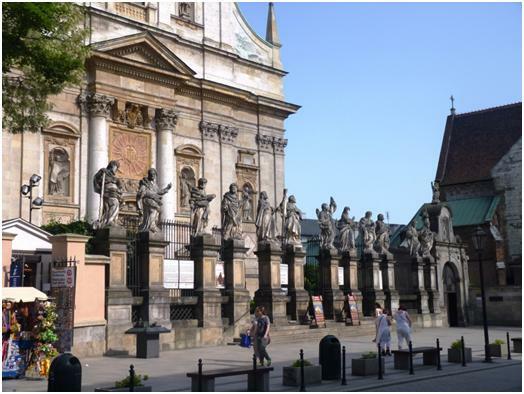 So the best definition would be the “pretty and scenic part of Silesia, close to the Czech and Slovak borders”. In European terms, it is also termed as part of the Beskids Euroregion. This is an example of the type of Eurobabble that gets the Union a bad name. An attempt to promote together for areas in three countries at the point of intersection. 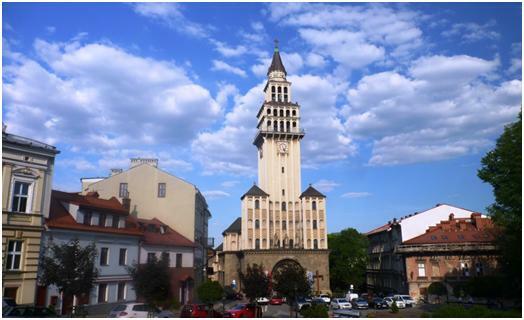 The town of Bielsko-Biala is therefore twinned for this purpose with relative neighbours, Frydek-Mistek in the Czeck Repbublic and Zilina in Slovakia. I suspect the only common ground here is those groundhoppers who have been to all three. Meanwhile a European grant is being sought in order to buy a hyphen and a second name so as Zilina does not feel left out in this hyphenated company. The town of Bielskp-Biala is extremely attractive, although my choice of hotel, situated in the old town centre did not seem so attractive when I realised the final stage of the ten minute walk from the station meant dragging my bags up a steepish hill with cobbled paving. The room was also too close to the cathedral, which while being very pretty, has a clock the chimes the hour and quarters. It does appear to stop at night, but then restart at six. I wanted a slightly later alarm call. It is quite a small centre, and I was surprised when wandering around to come across a group of four English groundhoppers, including Eddie. Pete had told me that he thought Eddie was going to the same game as me in Krakow the next day, so I had sent him a text message without reply. It was in fact a mixed message, as Eddie was flying to Krakow and spending time there, before seeing football in Bielsko-Biala and Gliwice. However, they had a tale of woe to tell. They had been told on arrival at hotel that match tickets were near impossible to get, as the game was already sold out. Their hotel knew a friend of a friend and had secured their tickets, but Dave Cox was apparently also wandering around, having failed at the stadium earlier (all closed). I had an e-mail from the club telling me that I would not get a press pass, but I could buy a ticket on the day. They did not say they were already sold out. The reason there was a problem at this less than attractive game is that the stadium has been undergoing a complete rebuild, and only the area behind one goal has been completed, limiting capacity to not much over 3000. Not being one to worry, especially as the station offices were probably still closed, I was easily persuaded back up the hill to the pub attached to the local brewery, (I had already spotted this, and had decided I was going to visit the bar anyway). So a pleasant hour was spent trying the local pale and red ales. I got to the ground just under 90 minutes before kick off, spotting Dave Cox en route, who said that despite originally being told sold out, they had found him a “poor view” ticket. The first reaction I got at the ticket office was “not possible”, but they were quite sympathetic to the fact I had been told I would be able to buy a ticket. These were not job-worth employees but people who wanted to help when there was a genuine difficulty. Eventually they found some more front row seats with limited viewing. When I said I would take these and then try to move higher up the ground to the press benches, a quick phone call was made, and instead of buying a limited view ticket, I was given the press card denied by e-mail! In the event, there were plenty of spare seats, and I moved from the press box (which was busy, and behind glass) to a seat near the top. While all the tickets had been sold, I imagine quite a few season ticket holders were missing this game. It was of importance to confirm the positions, Bielsko-Biala would be safe from relegation with a win, while only a win could delay Widzew Lodz in being relegated. When completed, the ground will be a compact two tier stadium and I would think completely seated. For the moment, only the area behind the goal is open. There are a lot of flags flying, but I noticed the number reducing during the second half as club stewards collected most of them in. A singing section was set at one end, slightly around the corner, but the whole stand joined in on occasion. No away fans were permitted, and there were no signs of any trying to break the ban, plenty of police on show just in case. The first period was quite frustrating, with Podbeskidzie on top, but struggling to get any shots on target, the resolute visiting defence seemed to be always in place to block the shot. However, when Pawela successfully turned the Lithuanian defender Leimonas, he was pulled down and we had yet another first half penalty, with Podbeskidzie 1-0 up. For a long time, it appeared it may stay that way, the Widzew defence were strong enough to withstand the attacks, but they could not put the home goal under pressure. The home attackers were not clever enough to get past the defence. When close to goal it was either an intercepted pass or shot, while from further out, they booted every shot high into the stands. The second breakthrough came just on the hour, when a foolish defenders’ pass gave space to the home attack – and Damian Chmiel became the grateful recipient. The game did open up a bit then, and a third goal was added on the stroke of full time. From the team list, I noted that Podbeskidzie is basically an all Polish side, (the exception being a Slovakian goalkeeper), while the visitors were a veritable league of nations, naming players from 8 different countries. My biggest disappointment here is they did not bring on Kevin La France to give me an opportunity to refer to the player as a French born Haitian defender. I do not think I have used the phrase before! All six English groundhoppers at the match headed for a bar attached to the castle, which was selling a variety of Polish beers, which we sampled until soon after midnight before turning in. I see Dave Cox again at the station before making my way to Krakow, he has picked on the slow bone-shaker as far as Katowice, but I need to stick to the not much faster and not much quicker service provided by Polish railways instead of the independent company. It is better to know my rail ticket is OK, then to hope they accept it. Dave was paying as he went. 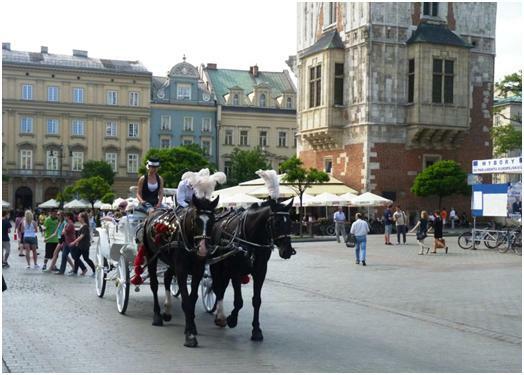 I last visited Krakow in 2003. It was a great city, but the then undeveloped Wisla ground was a very wet place to watch football. The city remains beautiful, but it seems to have become much more commercial in the last decade. While I made my way with difficulty when I visited Auschwitz, there are now tours offered on every corner. Of all places, I hope Auschwitz has not become a tourist rip off point as well. 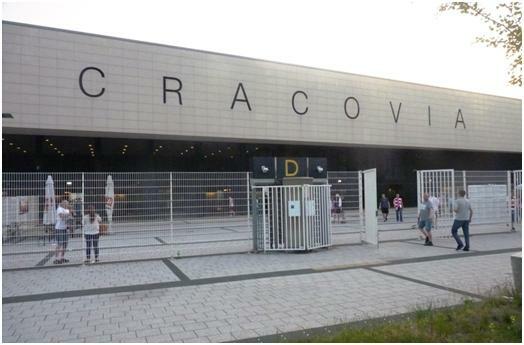 I headed down to the football ground of Cracovia, not far from the city centre with a little over an hour before kick-off. I had no trouble in entering as press, although all the signs suggested that I could easily have paid 25 Zloty for a good ticket. Not so easy for away fans perhaps. Only about 30 in at the start of the game, this doubled in the first ten minutes and then increased massively around half time. The attendance was 6276, but much of the stadium was empty. 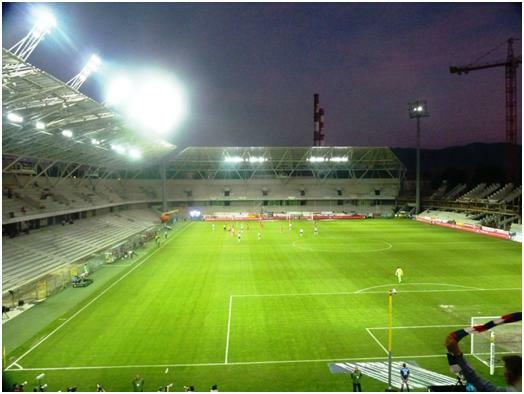 Except on the South side, it is a single tier stadium with the stands behind the goal having a roof stepped up higher than that along the north side. 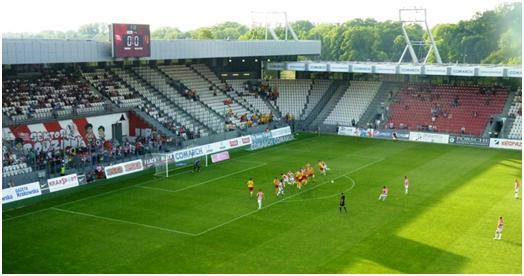 The noisemakers in the home fans have seats, (they do not sit) behind the goal at the “City End”, while the away corner is at the other end. When all the away fans were in place, we had a fine amount of competitive singing between the two groups. The main stand was two full tiers, and a mini-tier centrally positioned for VIP boxes. This means the roof here is again stepped up from the two ends. An unusual feature at the end furthest from the city (and hence not far from the away fans) is a cut away section immediately behind the goal. I estimate around 600 seats have been sacrificed to create this flat space with a wall at the back. It was being used as a crèche, with a small playground to the back of the area, some children and most parents stood at the front of the section and watched through the mesh fence. I have never seen this type of feature in a prominent pitch side position elsewhere. This entry was posted on Thursday, June 5th, 2014 at 03:13 pm and is filed under The European Game. You can follow any responses to this entry through the RSS 2.0 feed. Both comments and pings are currently closed.